Adobe has unveiled Shadow, a lightweight Web development utility that helps designers and developers preview designs on multiple mobile devices at the same time. The program, posted on Adobe Labs, is in beta and available as a free download. Shadow, which allows your mobile devices to synchronously browse with your desktop computer, is designed to aid in the testing and inspection of new designs and design updates. It promises to make the reviewing and debugging process more efficient by letting the designers see how each iteration will look on all target devices simultaneously. Shadow lets users pinpoint errors, experiment with new ideas and layouts, and view the changes on their devices in real time. It works over a Wi-Fi network, where all devices are connected to the same network. It takes into account the rapid changes in the development landscape, with new devices, operating systems, browsers, and browser versions. Different browsers have varying levels of capabilities, and are enabling new technologies in advance of W3C rules, requiring constant checking to make sure that a design works everywhere, or at least degrades gracefully. Shadow's targeted inspection mode lets users do most of the tweaking on their desktop computer without having to interact with the devices. Adobe explains that whereas today, most developers are working via trial and error, with Shadow, they’re able to control revisions from one place. Adobe Shadow browsing showing simultaneous remote inspection. Shadow joins other Adobe Labs Web development apps such as Edge, Muse, and Wallaby in the company’s attempt to propel its HTML 5 Web products forward, and move away from Flash-based mobile sites. This is consistent with the trend away from the company’s Flash platform for content creation on mobile devices. 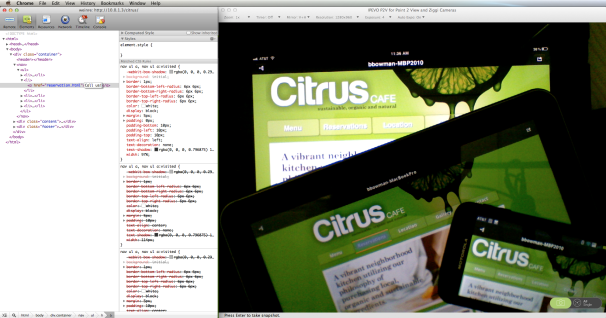 Adobe Shadow running in Google Chrome with remote inspection to various devices. Shadow leverages Weinre (Web Inspector Remote) open source software. In itself, Weinre takes some skill to use, however, Shadow places a front end on it that masks most of its complexity, thus designers need not have coding knowledge. There's zero configuration for using Weinre as part of Shadow. The final shipping product is expected to be released in the second half of 2012 in the Adobe store. It’s also available in the iTunes Store and the Android Market. While there will be a charge for the desktop commercial version, the price has not been revealed. Shadow will also be available for subscription as part of Adobe’s new Creative Cloud, due to launch within the first half of this year. Adobe has posted more information about Shadow on its Website and wants to hear from users about their experiences with the product before the commercial release.